The quotes may be delayed by up to 20 minutes. The quotes are updated only if your iPhone can connect to the Internet via either Wi-Fi or a wireless data network. Tap the i button in the bottom-right corner of the initial Stocks screen. The i is for info. Tap the + button in the top-left corner of the Stocks screen. Type a stock symbol, or a company, index, or fund name. Stocks finds the company or companies that match your search request. Tap the one you want to add. Repeat Steps 4 and 5 until you’re through adding stocks. Tap the Done button in the top-right corner. 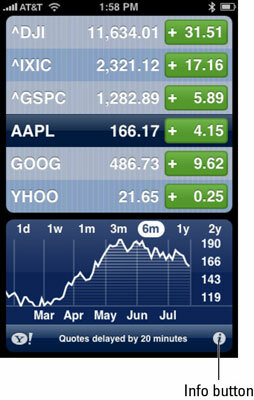 Tap the – button to the left of the stock’s name. Tap the Delete button that appears to the right of the stock’s name. Repeat Steps 2 and 3 until all unwanted stocks have been deleted.